I am continuing to clean up by writing about the photos hanging around on my phone and hard drive – hmmm, lots of them are of food, go figure. 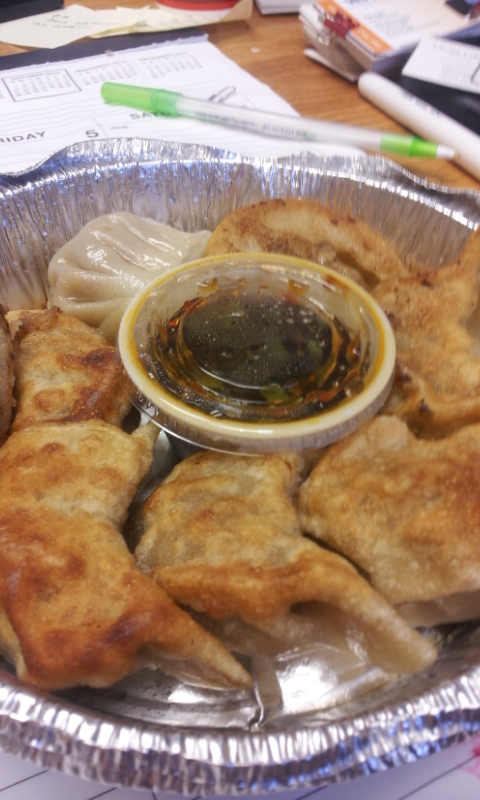 You might think these look like wonderful delightful fried dumplings, but you would be wrong. They were some of the worst dumplings I have ever had. Sad day. I will be avoiding China Wok on Harmony in Fort Collins in the future. 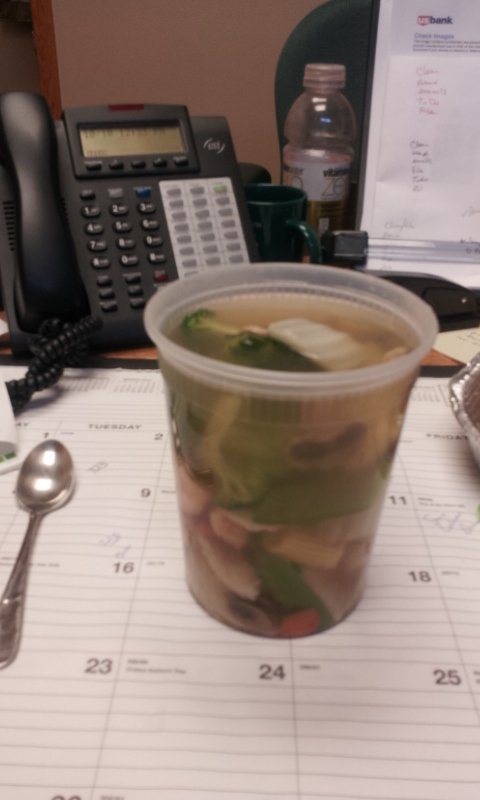 Same thing for the “Special” wonton soup, unfortunately. 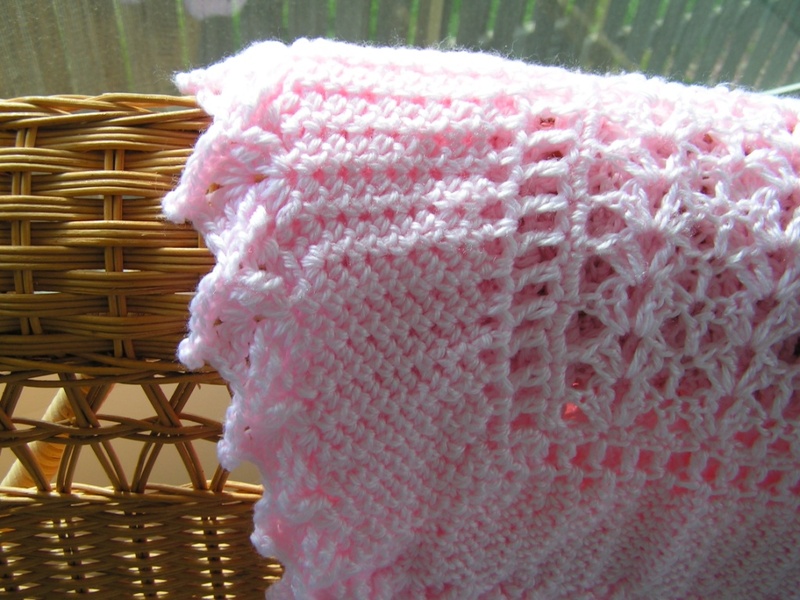 I make a crocheted baby afghan, a pieced quilt, and an embroidered quilt for each of my nieces and nephews when they are born (or, hopefully, shortly thereafter, although there is a five-year old who will be getting her embroidered quilt for Christmas this year….). I also offer repair service on these items if they are repairable. This is the latest from my nephew C., age 7. This was pretty easy to fix. This one, I am not sure about. 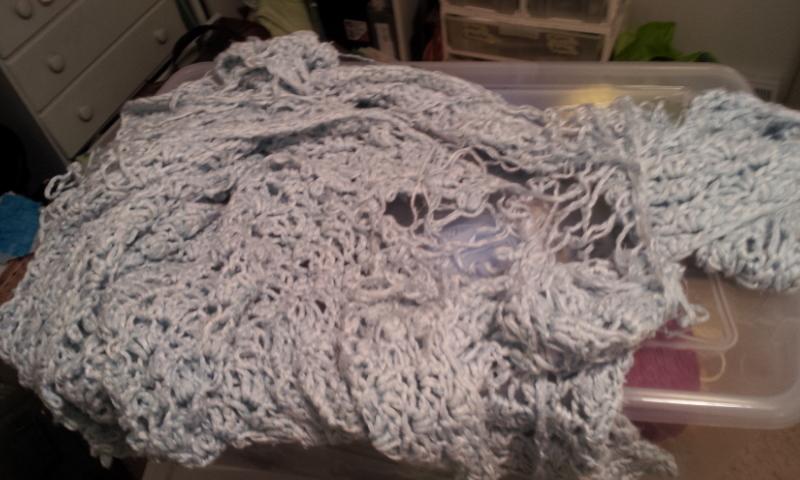 It is actually HALF of an afghan I made him (he got two, because he was allergic to one of the yarns in the first one, but he is over that now) – this aghan kept growing each time it got washed, so I cut it in half and finished the edges so he could have two. This one half is having a problem. 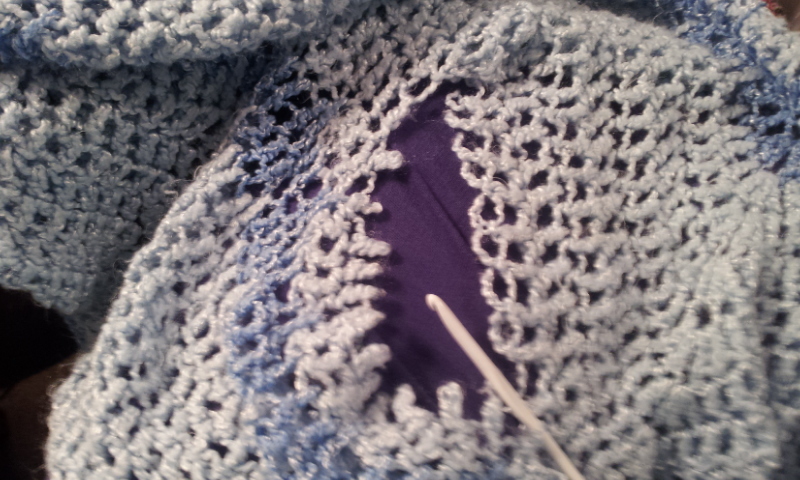 I am working on unraveling the tangle right now. Considering I don’t even remember which pattern I used to make this one, I may not be able to have it repaired by Christmas. 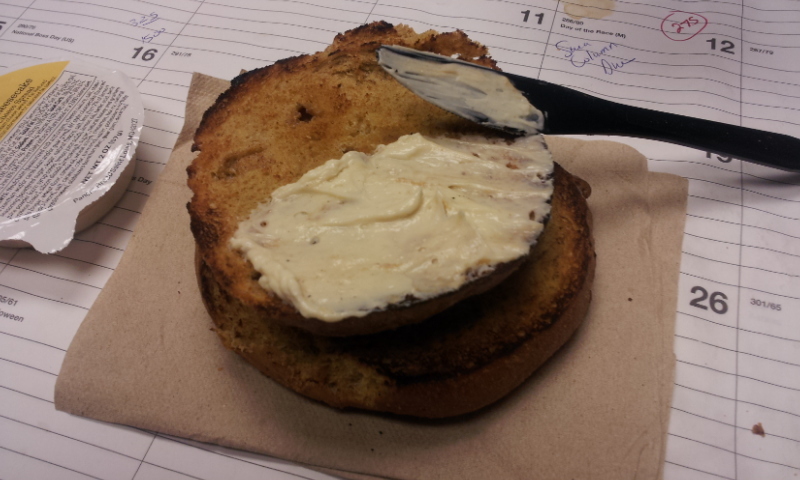 This is the new pumpkin pie bagel from Panera. Apparently this is a seasonal thing. 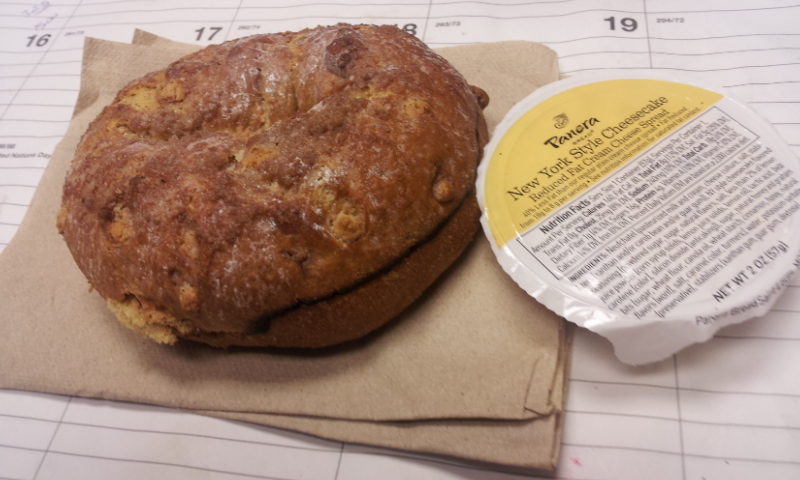 I thought I might like it because I love the Cinnamon Crunch bagel (which is the highest in calories of all of their bagels, oy vey). Also – what is the point of Cheesecake flavored cream cheese? I tried it because it was also new, but HUH??? It has some brown bits in it that are supposed to be cinnamony-graham cracker crust flavor, I believe. I will stick with my honey walnut from now on. It was not bad, but not better than the Cinnamon Crunch. It took me forever to remember where I ate the food in this next photo. It is a good thing that my phone puts a date automatically in the photo properties. This is a crab omelet (or maybe lobster?) 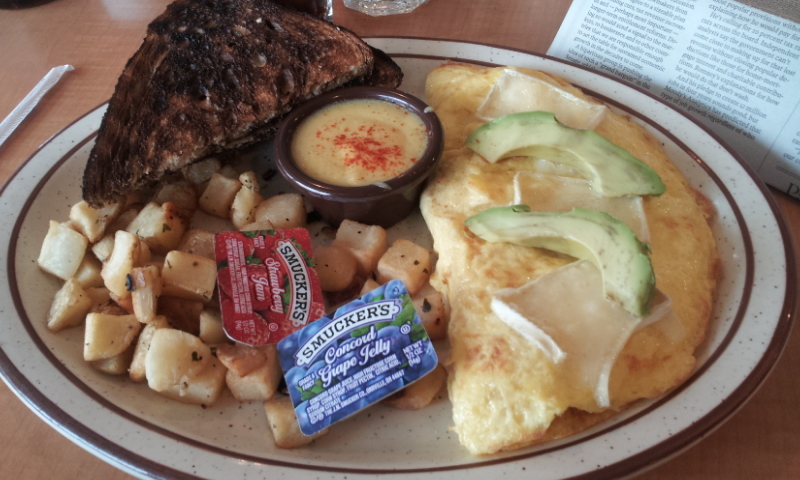 with brie cheese and avocado at the Le Peep near my house. I should learn my lesson, I like over-easy eggs or breakfast. But every now and then I get a wild hair and try something else. This was fine, better with the Hollandaise sauce for dipping. The toast was really QUITE well-done enough for me, I really prefer undercooked toast, I might have to start specifying that.